I've been reading the introduction to Jason Stanley's Language in Context, which I got my hands on this week, and it gives a nicer summary of the considerations motivating his project than I think we've had previously. I'm going to be reading the essays over the next while, and I thought I'd try to blog along the way. Here I'm going to be unambitious, and simply try to get straight on the motivations for the project Jason tries to carry out over the course of the papers. In this introduction, Jason seems to focus on three principle kinds of opponent to his project. Firstly, there are those who think that successful communication doesn't require that one grasp the same proposition as was expressed by another's utterance, but only one sufficiently similar (Jason attributes this thesis to Heck and Bezuidenhout). From his perspective, Jason just thinks this rests on an unsupported pessimism - part of his project is precisely to explain why grasping the proposition another's utterance expressed isn't nearly as demanding as people have supposed. The second kind of opponent, represented by the authors of Insensitive Semantics, agrees with Jason that semantics should offer up something truth-conditional, but thinks that asking for the intuitive truth-conditions is demanding too much. Instead the semanticist can only offer the minimal proposition - an 'informationally impoverished monstrosity' as Jason describes it (12) - and has to leave all of the real work - explaining how we so effortlessly gain information about the world from each other's utterancs, which presumably involves entertaining something other than the minimal proposition - to pragmatics. And, as Cappelen and Lepore very explicitly stress, if my memory serves me correctly, this view cannot avail itself of the resources afforded by speaker-judgments about the intuitive truth-conditions of utterances. As far as Jason is concerned, that's like trying to do syntax whilst ignoring native speakers' judgments of grammaticality and ungrammaticality; it's tying both your arms behind your back before the big fight. Lastly, we have those who think that semantics can only serve up things which fall short of determining truth-conditions - again, the real work is done at the level of pragmatics. Jason thinks that this just renders the whole process of interpreting an utterance of a sentence in a language one understands altogether too unconstrained and mysterious. We might be pushed to such a view should it prove that no project like Jason's can be successful, but it's not a fruitful starting point for understanding communication. Does this seem like a reasonable summary of the kinds of pressures Jason takes himself to be responding to? Sagittarius: A passionate and intelligent debate over semantics this week will unfortunately get bogged down by pragmatics. I've been following with interest the thread on Leiter Reports discussing Jason's post on the relevancy of facts about natural language to philosophy. Now Marc Moffett has a post up on Close Range critiquing Weinberg, Nichols, and Stitch's research indicating cross-cultural variation in responses to Gettier cases. It seems like this is to be the first in a series of posts on this topic. Anyone with a serious interest in philosophical methodology should head over there. 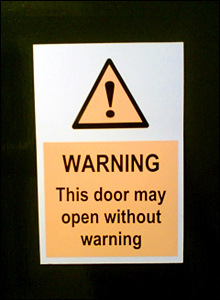 The BBC, for what reason I know not, has been asking people to email in pictures of silly signs. This self-defeating warning sign was my favorite. While I remember, I should point out that Aaron Cotnoir (who used to post on the now defunct UConn students' blog) has just started a new blog called Conundrum. Like Colin Caret, Aaron has moved all of his posts from the group blog over to his new digs. Aaron will also be joining me for the conference at Buffalo, so if you're in the area, you now have at least three good reasons to attend. (The first is, naturally enough, Stewart). Randy Barnett is giving a talk at UT next month, and its title is so awesome that it reminded me of something I've been meaning to do for a while now. Barnett's talk is called 'The New Originalism'. A good pun title is one that makes you laugh, yet at the same time groan and feel a little bit inside of you has died forever. The bad simply encourage a sense of deep sorrow at the state of the world. And, of course, there's a very fine line here between the good and the bad. So what are people's favorite and least favourite pun title for recent philosophy papers? Here are some of mine (in no particular order) to get things rolling. (I hope I hardly need add that this is just meant to be for fun - no offense is meant to anyone, nor should these be regarded as comments on the content of any of the papers mentioned). I'll add more as they come to me. The comments thread is all yours. Now, Derek Ball pointed out to me that Gualtiero Piccinini has a similar page on his homepage, and on the blog Brains. I have no desire to step on any toes, but I'm hoping having a page more focused on the specific concerns of grad students - job market and publishing - will be helpful. Piccinini's page features (very useful!) links to advice on getting into grad schools and writing philosophy papers in addition to jobs and publishing, but these won't be of much concern to my target audience, who are already past that stage. My aim is to more comprehensively cover the more specific concerns of grad students. I hope people find the page of some use. Details of how to make suggestions concerning additions can be found by following the link above. Well, the semester has really gotten underway, and it's just hectic. I don't remember ever having a first week where I felt so busy before. Anyways, following on from my earlier post, I have some good news. I'm heading out to the Reason, Intuition, Objects: the epistemology and ontology of logic conference at SUNY Buffalo next month to join my one-time philosophy of maths professor, Stewart Shapiro, and others for the weekend. I'm presenting my paper on set theory again. As regular readers of this blog will know, Kenny had some pretty persuasive things to say against some of the kinds of arguments I developed in the paper, but while I think he was clearly onto something, I hope there's still a lot to be said on these issues. While I'm indulging in some navel-gazing, I was wondering if anyone has access to recent issues of Acta Analytica. Apparently I figure in some small way in this paper by Nenad Miščević, and I'm just a little intrigued. Any light that anyone could shed would be welcome (and I hope people won't think I'm too ridiculous for asking!). One last piece of news. Sadly, What is it like to be a blog?, the blog of the graduate students at UConn, has been put to rest. As I'm sure you are all aware, WIILTBAB was home to many interesting discussions on dialetheism and paraconsistency, Dummettian anti-realism, logical revisionism in general, and a host of other topics from metaphysics to the ethical grounds for vegetarianism. The good news is that Colin Caret, the man behind many of these discussions, has set up a single authored blog called Inconsistent Thoughts on which he'll continue to post about these issues. Be there and be square and not-square. I think it's worth drawing attention to the new philosophy journals WIKI. It's already got a fair amount of data about which journals give prompt responses, which give comments, whether those comments were appropriate, how long the backlog is, etc. The data's currently horribly presented, but hopefully it'll be streamlined as the page builds momentum.